For a direct activation of stepper motors we offer our Step3S card which has been refined in technology and successfully approved for many years. Besides the possibilty of controlling 3 to 4 axes, this card also provides many useful additional options for fast and easy retrofitting or resetting smaller CNC machines. We focused on presenting a state-of-the-art design and a technology that fulfils all requirements of applications as realized in the last years. 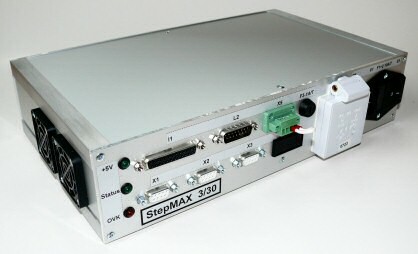 For the activation of stepper motors the Step3S card can be aquired as single part or as a complete package integrated in an appropriate and robust desktop casing. Additionally, we can provide relevant stepper motors in any price and performance categories as individually required. Detailed information to stepper motors can be obtained in the menu products-accessories-motors. 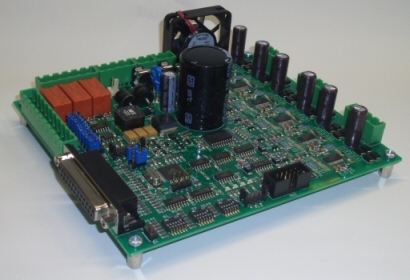 The stepper motor driver board Step3S is ready for use immediately after being connected with WinPC-NC, PC-Posi or CNC-Control. Pinning is fully compatible to the output signalsof these CNC programs and functions on any LPT interfaces. Furthermore, it is possible to use Step3S in combination with other programs, e. g. Mach3 and NCdrive. By using the small additional module Step1S which is directly plugged and screwed on the main board it is possible to modify Step3S into a 4 axes stepper motor card. Settings for signals, resolutions and current of the 4th axis are directly made on the main board as it is the case of the 3 main axes. The stepper motor driver board Step3S is available in four various versions. A detailed instruction manual and the corresponding connectioncables are included in the package. The pluggable module Step1S includes all small components and accessories for a fast and uncomplicated assembly. 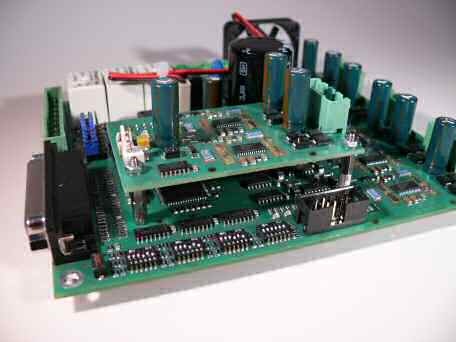 Our stepper motor driver board Step3S is also available with the individual required power supply and with a functional desk-top casing. This is the best solution concerning control systems for all selfmade-users who intend to createtheir own specific units as they can obtain any kind of control software and the corresponding electronics from one single source.